We love soba noodles especially when the weather is hot and humid. This is the first time I am sending soba to school with Nikolai. I tossed the noodles with sesame oil so it will not get stuck together in one huge blob and Nikolai loves the flavor. I also included a small container of tsuyu (soba dipping sauce) for him to pour over the noodles instead of dipping at lunch time. Organic soba noodles with mild cheddar ears and nose, provolone eyes and nori pupils. I used my cutezcute panda stamp for the nose, circle cutter for the ears and eyes. Meatballs in a pea pod silicone cup, seedless red grapes and organic baby carrots. Tsuyu sauce in a MonBento sauce container. 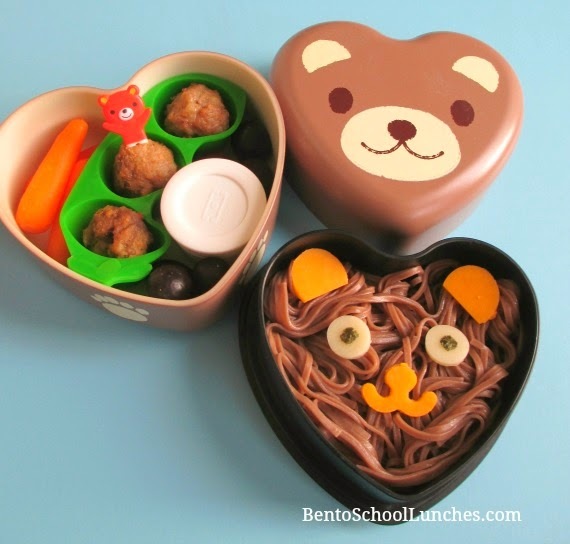 This lunch is packed in a cute heart shaped bear bento box. So adorable! I love this one! Adorable! My boys love soba! Yummy I love soba! Great for hot weather. Very cute bento and I am sure he thoroughly enjoyed it!